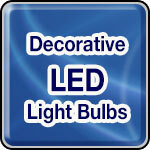 Decorative LED bulbs can be used in many fixtures. Replace a bulb in your lamp, chandelier, pendant lamp or sconce with decorative LED bulbs. These LED bulbs can be used for outdoor applications as well. Using less energy than incandescent alternatives, these bulbs will save you energy and money. Choose from various decorative bulb shapes, types and color temperatures below to find the right bulb for the application. Call Genesis Lamp with any questions about our LED bulbs.